Quotes can be a powerful way to add oomph to your writing. They can validate what you are expressing. Quotes can inspire and be used as motivation as well. 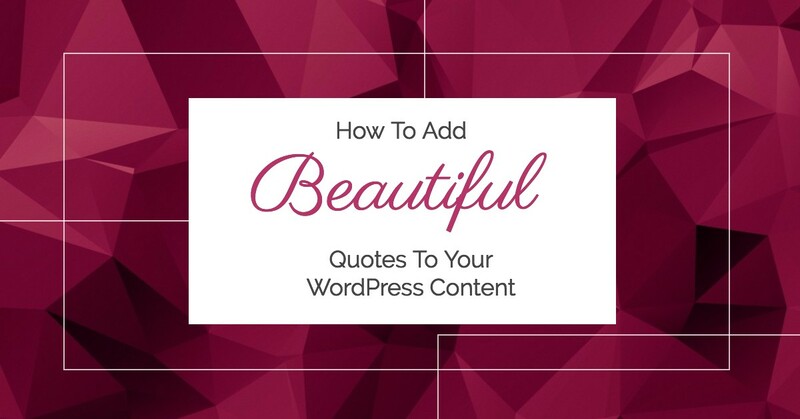 No matter your reason for using quotes, making them stand out on your website is crucial. If you are using a quote in your writing, you want that quote to stand out. WordPress has a block quote function built into the standard WordPress dashboard. Check out the screenshot below. Personally, I often want my quotes to have a bit more pop to them and that is when I use the options built into Thrive Content Builder. TCB is a premium WordPress plugin that I use to beautify my WordPress content. Thrive Content Builder has 9 quote template options that you can customize for your needs. In the screenshot below you will see two of the designs. In the tutorial video listed below, I show you how tutorial video below you will learn how to use the standard WordPress block quote option and how to use each of the 9 Thrive Content Builder options. Note that with Thrive Content Builder you can easily change the color of the quote boxes. These Thrive Content Builder Boxes are designed for testimonials, which is a fantastic use but I also use them to jazz up quotes in my content. When you use a quote in your content or a testimonial make sure that they stand out. Hopefully, this gives you a few ideas on how to do that.